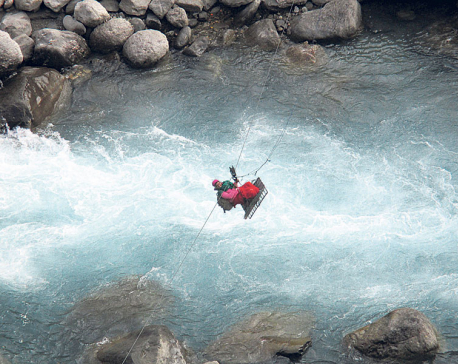 JUMLA, Jan 19: Tuins are high-risk contraptions for crossing treacherous rivers in the remote reaches of Nepal. Many people in Jumla and neighboring districts have lost their lives trying to use these primitive facilities. They have no choice but to continue using them for the sake of some mobility. “Using the tuin means literally putting your life on the line. However, we have no choice,” said Gulam Rawal, chairperson of Kharpunath Rural Municipality - 3. “They carry out surveys here almost every year to build bridges, but no bridge has materialized yet,” he added. Rawal himself uses tuins on a daily basis. The zone at the greatest mercy of twins is from Hilsa to Kawadi where there are many rivers but not a single bridge. “This is the grim reality for people around Humla. It’s back on the twin whether I go to tend to my fields or go to my office. What else can I do?” he said. It’s the same story when a woman goes foraging. The only difference is that she sometimes has a little child strapped to her back as they take to the inevitable tuin. “It’s a double risk,” Rawal lamented. The government has replaced many tuin crossings with bridges in other parts of the country. 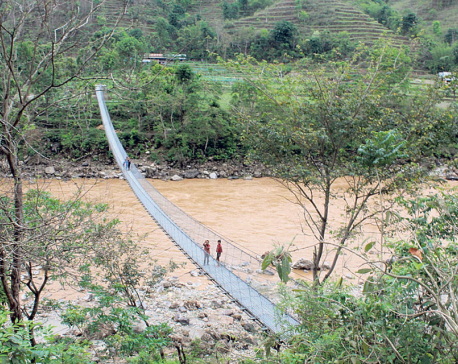 But the Karnali region still awaits its bridges. According to Rawal, locals were excited when the government announced about a year ago that bridges would go up where the tuins now straddle. “But it seems we are not in priority”. Dhana Shahi, member of Kharpunath Rural Municipality - 3, also lamented the delay in replacing the tuins. The government’s indifference toward the people of Karnali has not yet changed, she said. “Many lives have been lost using the tuins, and many cattle also,” she said. Birjeet Pariyar, a local of Reep village in Humla, uses the tuin every day to carry firewood home. 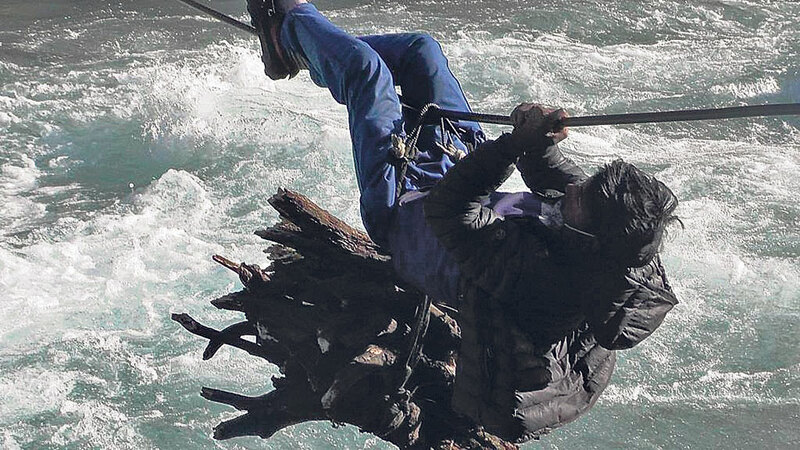 He has been doing this for several decades, but it still sends a chill down his spine every time he clings to the tuin rope to make another precarious crossing. There is a bridge over the Karnali River in the Giusi area. But to get to the bridge, the locals have to walk some three hours. “The tuin, such as it is, is a great time-saver,” Pariyar said. It is estimated that over a dozen tuins, most of them in dilapidated shape, are in use across Humla. Beyond the Karnali, there is no clear picture how many tuins are in use. According to Makka Rokaya, a local of Karpunath - 4, children also have to use tuins, which is very concerning. “When a child comes home late, we immediately fear whether the tuin rope has snapped. That’s the first thought that comes to mind,” he said.